Creationists will sometimes ask evolutionists how they can account for life, and the response they sometimes get is that evolution is only about how life evolved into a variety of different forms and that it just doesn’t deal with how life came into existence. I believe this response is short-sighted. Life is not the only thing that evolves through natural selection. We know that memes (understood in Richard Dawkins’ original sense) evolve even though they are not lifeforms.1 We know that language can evolve.2 Likewise, computer viruses may evolve, and actual viruses may evolve even though we do not number them among lifeforms. 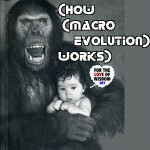 Evolution by natural selection works with anything capable of imperfect reproduction, whether alive or not. This leads me to the idea that life came about through evolution by natural selection. Before any life existed, there were non-living replicators, similar, if not identical, to things like RNA, DNA, and viruses. The DNA that we use to reproduce ourselves is not itself a living organism. In our case, our DNA includes instructions for building living organisms, and it relies on these living organisms to spread it to future generations. Before DNA ever built any living organisms, it may have been in the business of building non-living organisms, simple machines that would spread it further. And before DNA made any kind of organisms, it was just copying itself. DNA may have evolved from something simpler, such as RNA, or both DNA and RNA might have arisen separately, or both might have evolved from a common ancestor. However it happened, the complex DNA that began to build living organisms evolved through natural selection from more primitive replicators. But how did the first replicators get started? Replication is simply what you get when you combine the processes of growth and division. I came to this insight when I created a Chess variant that inadvertently included the reproduction of pieces. I had created one game called Metamorph Chess and another called Fusion Chess. The former let simple pieces promote to compound pieces when moving away from an attacked space, and the latter let compound pieces split into their component pieces, such as a Queen splitting into a Rook and a Bishop. I then combined both games together into a Chess variant called Metamorphin’ Fusion Chess. Thanks to being able to promote simple pieces to compound pieces and thanks to being able to split compound pieces into simple pieces, this game allowed for the reproduction of pieces. So, all you need for reproduction is growth and division. Division is easier to account for. As something grows, it will eventually reach a size where it becomes too difficult for it to remain together as a single unit. Think of constructing a house of cards. The more cards you add to it, the more unstable it will become, and the more likely it will be for it to fall apart. So the main thing we need to account for is growth. One mechanism for growth is gravity. For example, gravity pulled hydrogen atoms together to form the first stars. But gravitational growth is not what is needed here. The kind of growth typical of life is that it converts external materials into structured parts of itself. This is growth that happens through the ability to fit things into a structure. This doesn’t require intelligence. It just requires a structure that is somehow able to sort different materials into different areas. Think of a simple coin sorter. You drop a coin down a ramp, and it rolls until it reaches a slot large enough for it to fall through. So it will sort coins into dimes first, pennies second, nickels third, and quarters fourth. But where did the first things capable of structured growth come from? After stars produced different kinds of atoms, these atoms would fall together into different kinds of molecules. The stable molecules would stick around, and the unstable molecules would quickly fall apart. So, over time, there would be an accumulation of different kinds of stable molecules. Some of these molecules would fall into arrangements capable of structured growth. Crystals are capable of this. The molecules that crystals are made of naturally allow them to grow in a structured manner that repeats the same pattern. If a crystal breaks apart, its parts can continue to grow. However, crystals are not alive, and the life we’re familiar with is carbon-based. It appears that carbon is capable of the same kind of thing crystals are, though on a smaller scale. When I searched Google for “growing carbon,” I learned that scientists are growing carbon nanotubes. The four molecular components of DNA are all carbon-based molecules. They are cytosine (C4H5N3O), guanine (C5H5N5O), adenine (C5H5N5), and thymine (C5H6N2O2). These also all have hydrogen and nitrogen in them, and two also have oxygen. The common components of these molecules probably allowed them to fit together in regular patterns that could be added to. This allowed for growth, and growth led to division, which is how reproduction happened. The likelihood of molecules falling into arrangements capable of structured growth might be rare, but once it happened once, it could keep on going. The processes of growth and division would lead to an explosion of molecular structures with the same properties. This would normally lead to copies of the same kind of thing, but when errors in the process cropped up, it would result in slightly different molecular structures. Some of these changes would give the new structures the ability to reproduce themselves more efficiently than others. Also, the continued reproduction of replicators would change the environment. Two changes to the environment that would seriously impede reproduction would be overproduction of waste products and overpopulation. In reproducing themselves, it’s to be expected that they would sort the available materials, perhaps in a simple coin sorter way, into what they can use and what they can’t use. They would make themselves of what they can use, but they would eject what they can’t use back into the environment. After enough time, they would be surrounded by their own poop instead of the materials they would need to make more of themselves. The solution to the overproduction of waste products would be for some replicators to evolve the ability to use these waste products as food or fuel. After life emerged, for example, solar-powered plants overproduced oxygen, then oxygen-breathing animals evolved. Overpopulation could lead to the situation where replicators run out of the material they need to make more of themselves, because that material has been used up in making them. The solution to this problem would be for some replicators to start making themselves out of other replicators. This would introduce predators into the environment, which would make others prey, and then natural selection would favor advantages that made some better at catching prey or at avoiding predators, and this would drive an arms race that would regularly change the environment and select for greater and greater complexity. One new ability that would prove crucially important to solving these and other problems would be the ability to construct machines. I’m not talking here about human beings creating machines. I mean that something on the level of DNA would build simple machines that would give it various advantages. As the environment changed, replicators who were building simple molecular machines would have a serious advantage over those who weren’t, for their machines could help them better adapt to new conditions. Over time, as the machines made by DNA happened to improve, natural selection would favor these improvements, leading to more complex and versatile machines. This is analogous to the growth of technology among humans. Our technology gives us tremendous advantages over other animals, and the machines created by DNA gave them tremendous advantages over DNA who didn’t build machines. One of the main differences between us and DNA is that DNA is not autonomous. While we can direct the use of machines with our will and intelligence, DNA cannot. So, the machines that would prove most useful for DNA would be autonomous machines, that is robots. A robot may be programmed ahead of time, but it can operate without anyone exercising direct control over it during its operation. Now, it should be understood that there is a grey area between a fully autonomous robot and a robotic tool. We don’t yet have the conscious, fully artificially intelligent robots that we find in science fiction, but we do have robotic factories, simplistic robots, such as a Rhoomba, and machines that do a particular job on their own. 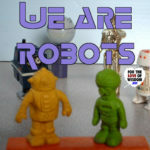 For the present, we mainly use robots for the automation of particular tasks. For example, a Rhoomba can move around the floor vacuuming it, but it can’t wash dishes or look after the kids. Even simpler than a Rhoomba is a fan. A fan just circulates air by rotating blades. Aside from needing to be turned on and off, it is able to do its job autonomously. The difference between a Rhoomba and a fan is that the Rhoomba has some ability to change its behavior depending on the circumstances. Another machine with the same kind of ability is a heater controlled by a thermostat. These examples illustrate that DNA could have benefited from machines that performed very simple functions. So DNA could have started with machines that were not fully autonomous agents but which were still able to automate behavior or respond to the environment in favorable ways that helped the DNA survive or spread. Analogously to this, I have written my own programming language, known as GAME Code. It is a Turing-complete programming language, equipped with all the math, logic, and control structures common to other languages. But it did not start out as a programming language. It started out as simple commands for automating moves in Chess variants played online. For example, a player gets to keep captured pieces in Shogi, and I wrote code that would automatically move a captured piece to an area off the board without the player having to do it manually. Other games also benefited from automation. For example, I automated en passant and castling in Chess, so that each could be done as a single piece move. Over time, I wanted to automate more types of moves and enforce some rules. Eventually, what began as simple commands for automating moves turned into a full-fledged programming language with math,logic, control structures, functions, and subroutines. 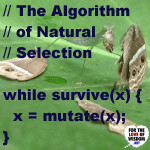 Getting back to DNA, natural selection would, over time, favor machines with more complex programming that could handle a greater variety of circumstances better. In general, it would favor machines capable of locomotion, energy production, waste disposal, growth, awareness, and decision making. As machines came together with all of these abilities, these machines would be robots capable of housing, sustaining, and reproducing the DNA that made them, and these robots would be what we call living organisms. It should be understood here that even a simple cell, such as an amoeba, is a robot for housing, feeding, and replicating DNA. Compared to the DNA, a cell is like a city compared to a single person. Like cities have grouped together into counties, states, and countries, cells grouped into multi-cellular life. Most forms of multi-cellular life developed a division of labor and developed different capacities, such as locomotion, awareness, and intelligence. These properties belonged to the robots that DNA was making to shelter, feed, and replicate itself. It was not doing any of this consciously, though some of the machines it produced did become capable of consciousness. While some DNA was evolving to make robots, other DNA was evolving to exploit these robots. There is no law of nature which says that the machinery built for the sake of protecting and propagating DNA must be used only by the DNA that made it. Once these robots are made, other DNA may try to hack into the replication machinery of these robots to replicate themselves. This is not hacking in the conscious sense that humans hack computers, since DNA has no consciousness, but it gets similar results. The DNA that evolved to hack and exploit robots made by other DNA are what we call viruses. These evolve alongside life without being or producing life. 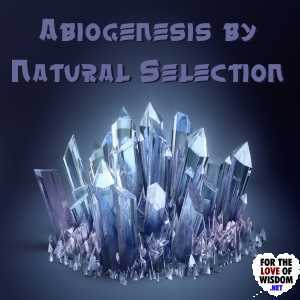 This is solid evidence that living organisms are not the only organisms evolving by natural selection, and it points us to what our prebiotic3 genetic ancestors were like. In a nutshell, life evolved from non-living organisms similar to viruses, and it did so by natural selection. There was no first living cell that appeared by intelligent design or by amazing chance. The first living things were robots built by DNA for its own protection, growth, and reproduction, and these had evolved from DNA that had built simpler robots, which had evolved from DNA that had built simple machines. Once the first living organisms appeared, their reproduction kept changing the environment, so that natural selection kept favoring improvements. These improvements included preying on other lifeforms, avoiding and protecting oneself from predators, using the waste product of another type of organism as fuel, division of labor, locomotion, sexual reproduction, awareness, decision making, and generalized intelligence. Through evolution by natural selection, the robots made by DNA became more lifelike and sentient, eventually evolving into us. For how the universe got to the point where this was all possible, I recommend my earlier article, Is God Needed for Scientific Laws?. For more on our nature as robots, I recommend my later article We are Robots. For more on how life evolved into us, I recommend nearly any one of my other articles on evolution. Evolution by natural selection accounts for life, not just for the diversity of life. ← Are Atheistic Worldviews Religions?